For the rookie Giggs, who kept the 3-4-3 system that served predecessor Chris Coleman so well and saw Vokes add his second before the hour, it was a serene introduction to international management, crowned by the man who has replaced and arguably surpassed him as Wales' world-class inspiration on the field. The Burnley striker duly got in on the act, diverting Andy King's knockdown into the bottom corner following a wonderful raking pass from Bale, who almost had a hat-trick when Yan beat a sweetly struck 20-yarder to safety. - This is Wales' biggest margin of victory since August 1996 when beating San Marino by the same scoreline (6-0). - The 6-0 win is the biggest win for any Wales manager on their debut and Giggs is just the fifth different manager to win by such a margin (Committee, Mike Smith, Terry Yorath and Bobby Gould). - This loss was Marcello Lippi's biggest margin of defeat as an international manager (0-6). - Wales have scored as many goals in 2018 as they did in the whole of 2017 (six goals, eight games). - Gareth Bale has now scored the first goal under three of the last four managers of the Welsh national team (Brian Flynn, Chris Coleman and Ryan Giggs). - Gareth Bale is now the top scorer for the Welsh national team with 29 goals, breaking the record of 28 goals previously held by Ian Rush. 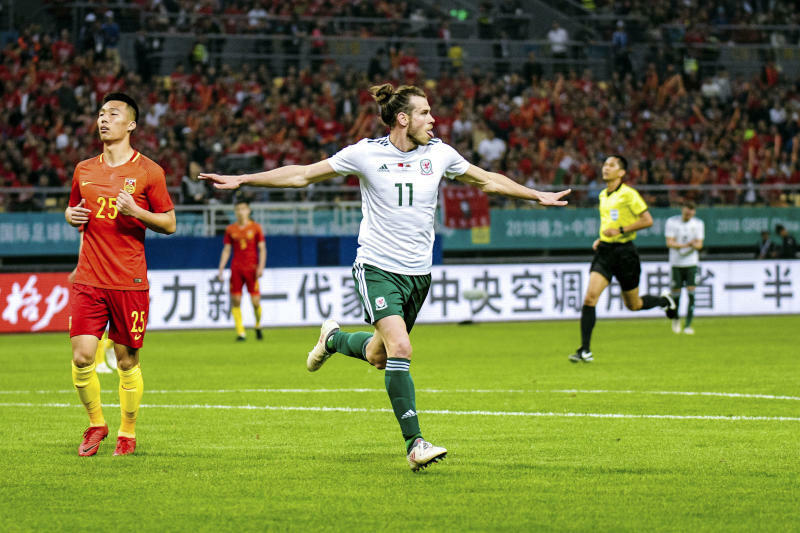 - Bale's hat-trick was his first at international level, making him the first player to bag a treble for Wales since Robert Earnshaw vs Scotland in 2004. - Sam Vokes was directly involved in four goals against China (two goals, two assists); as many as in his previous 31 games for Wales.